Papua New Guinea Prime Minister, Peter O’Neill has announced that an immediate State of Emergency has been Declared for Highlands Earthquake Disaster areas in Hela, Southern Highlands, Western and Enga Provinces. The National Executive Council has further approved K450 million for relief operations and to restore services, as well as the formation of an Emergency Disaster Restoration Team and the Establishment of a Restoration Authority. "This is an unprecedented disaster in the Highlands Region and the appropriate response is underway by the National Government,” the Prime Minister said. "A State of Emergency has been declared to expedite the restoration of essential public services including healthcare services, schools, road access, airports, power and communications facilities. “An amount of K450 million has been approved for disaster relief, services restoration and the rebuilding of infrastructure. “An Emergency Disaster Restoration Team, led by Dr. William Hamlin, as the Emergency Controller, will now manage and co-ordinate all restoration activities working with Provincial Authorities. “The Emergency Disaster Restoration Team will be supported by Department of Works and Implementation, and all other relevant Government agencies. "Cabinet has further approved the establishment of a Restoration Authority that will manage long-term reconstruction efforts over a 4-year period to fully restore normalcy. “An emergency session of Parliament will be convened for the presentation of legislation that will establish the Restoration Authority, with the date of the session to be announced by the Speaker of Parliament." The Prime Minister said relief efforts are already underway, and further assessments provided to focus operations to areas in need. 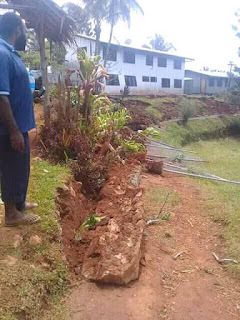 "Members of the PNGDF and disaster officers were dispatched to the affected areas immediately following the earthquake, and are working with Provincial Authorities, particularly with the Governors of Hela and Southern Highlands Provinces.